Warming up properly- the key to fat loss and muscle growth! Today’s topic may not be all that exciting, BUT the warm up can actually make or break the whole workout and limit gainz, as I found out myself in a rather painful way. Not to bore with my sob story, but it might explain where I am coming from. I am what you would call a hard gainer and struggled for years with building quality mass. I would either get strong and fat or injured, or both. As for programs, you name it. I tried them all: 5×5 HIT, HST, volume, 2 a days, etc. In short, my results were abysmal until I found out what I was doing wrong: I was training too long, not intense enough, and lastly, I was never ready to train. Neither mentally, nor physically. I simply did everything wrong, from pre workout nutrition, to stretching, to picking warm-up exercises, to warm up weights, to hydration levels…The term “warm up” is wrong; “getting warm” is the least of your worries. You should be getting ready to train at your max capacity at that very moment within your actual range of motion. Here is what usually happens: 10 min stretching (chatting with lifting buddy), which makes you weaker (more on that later), 10 minutes on a treadmill, and some light sets to get the blood going. Five to ten minutes rolling should be sufficient. Once you are done with those exercises you can go into your first work set. This covers the training part of the warm up; the treadmill part you can keep it, as it won’t do any harm. Ten minutes will suffice though. 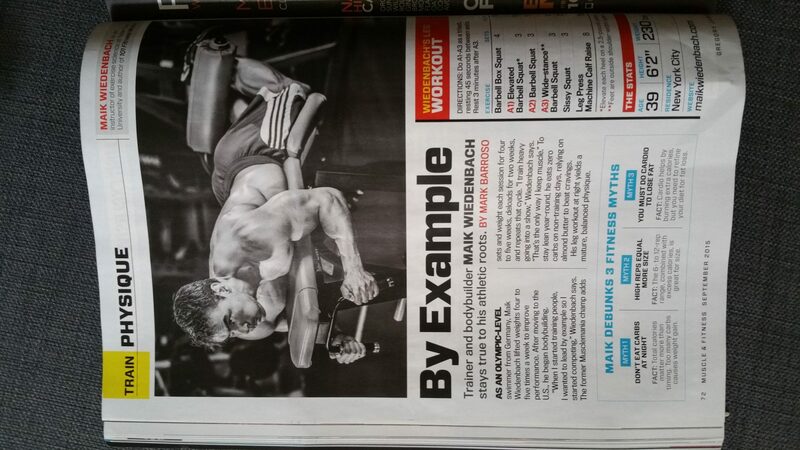 on CNN, yours truly made this months issue of Muscle and Fitness! Yay! Previous post: Kettlebells- Czarist Russia No 1 contribution to fitness and fat loss? Next post: 8 things that are wrecking your workout and how to avoid them!